There’s a bunch of properties here and I expect it’s going to change drastically before release. For now though, the JSON object specifies that the material is rock (rather than wood, metal, or a bunch of other pre-defined types. This list of types will itself be driven from a data file though today it is hard-coded), specifically sedimentary rock (this info is used by the map generator when deciding where to place it), a prevalence of 2 (meaning it’s more or less common than other types or rock with a different value), it’s colour as a HTML-style hex code, “isFluxMaterial” set to true as a special property indicating it can be used as a flux in the creation of steel from iron (more on that another time!) and a list of ores that may be found in limestone, which are themselves driven from a similar list of materials of the “ORE” type. It’s currently trivial to add your own types to the list of rocks, give them a colour of your choice, and they’ll automatically be used in map generation which will then be imported to the main game. The types of rocks, ores and gems in the game currently can be considered a placeholder, and I’ll be adding more variety (as it is now so easy to do so) before the main release. You’ll notice this includes a “_info” property to help modders understand how to change it. “colors” is there as a convenience to give names to more hex code colour values which are then described in an array for different times of the day (against a 24 hour clock). The game engine then blends the two colours for a specified time together (e.g. at 22:00 will mostly be the “Dawn” colour with some of the “Moonlight” colour) which you can see in action in the video. Whereas the rock materials described earlier can be added to by mods (i.e. more materials can be added while including those in the base game), I expect the sunlight colour data to be entirely replaced by a single mod, as described by the “_info” property. When the game is ready for a wider audience I plan to write more documentation on how to create mods for the game. Similarly, the characters in the game and their constituent parts (such as the dwarves’ beards, hair, clothes and so on) are each individual sprites which are layered on top of each other, and in some cases coloured in (such as hair and skin tones) like the rocks at the top of this post. Each part of a character has its own JSON data file describing what it is, which kind of characters it can be added to, any colours to apply (as a generalised “skin tone colour” that could be different for each one), and any layout adjustments such as scaling the sprite to be bigger or smaller, or adjusting its position relative to its parent (as an example, a head is placed a certain amount above the character’s body). These assets are stored and described individually, then combined into a single spritesheet and dataset by the game engine automatically. 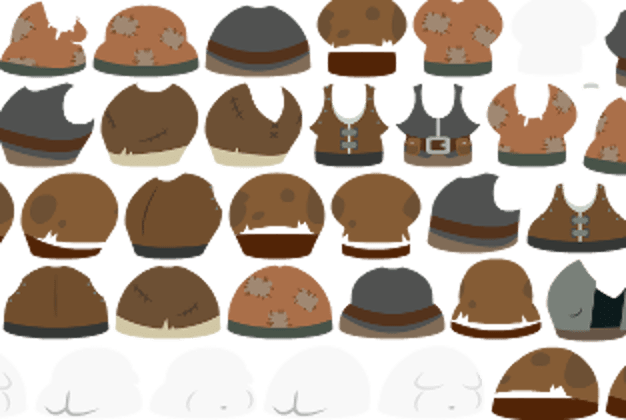 Here you can see a small part of the spritesheet automatically generated by the game engine, showing some of the current dwarf clothing plus a fat dwarf’s naked body (sorry about that) which is stored as a greyscale image to be combined with a specific skin colour as it is rendered to the screen. In summary, using this approach makes it a lot easier for myself to add more content to the game easily, including a lot more variation in terms of colours as you’ve seen. Better yet, it’s designed from the ground up to be open to modders to make their own additions or changes to the original assets, which I have no doubt will result in more and much better content than I’d be able to add by myself. Modding isn’t properly opened up yet, that’s scheduled for the update after Alpha 1 in February. The intention is you add to the mods directory and that gets compiled by the game into the assets directory. For now you can only really modify things in the assets directory which isn’t the intention. I’ll be sure to put out plenty of guides when modding does become enabled properly!